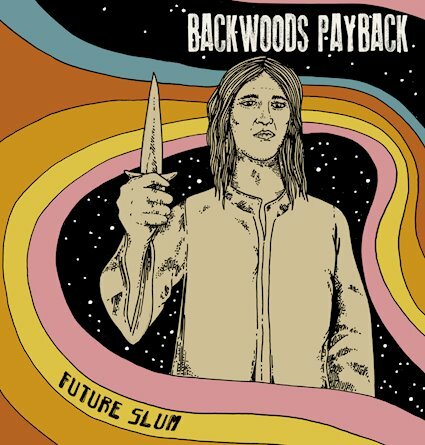 Backwoods Payback have always sort of operated on the fringes of my understanding of stoner rock. While I've been aware of them for a while, I had not realized that these guys have been doing this for fifteen years. Then when you kick on their latest offering, Future Slum it becomes clear that since 2003 they have been refining what can only be described as one of the most potent understandings of the heavy rock genre that it has been my pleasure to listen too. This is a monolithic release and one that borrows from all sides of the music. The struggle with a lot of modern stoner rock is that it falls into many of the same tired tropes. Backwoods Payback certainly play off of some of those tropes, but if you listen to a song like It Ain't Right with its warm grungy riffing it becomes clear these guys are tapped into a whole lot more. This isn't just music for the knuckle dragging riff lord, this is music that combines exciting ideas to create something potent and almost larger than life. The bands songwriting sensibility on Future Slum is impressive to say the least and continually hints at so much more that this band can be and eventually evolve into. It's always nice when you see years of hard work paying off. The colossal stomp of a track like Threes is the conjuration of a veteran band. The ebb and flow of this record around endless good ideas makes for listening that you aren't going to easily forget. Eerie at times and boisterous at others Backwoods Payback revel in great ideas and putting them into glorious sonic form. This is a band who have come to terms with who they are and what they represent making this a thrilling spin from front to back.